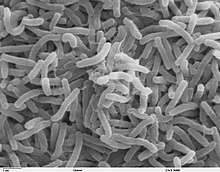 Scanning electron microscope image of Vibrio cholerae bacteria, which infect the digestive system. Bacteria makes up one of the three domains of life. It is part of the prokaryotic domain and is often referred to as "Eubacteria" to distinguish its domain from "Archaebacteria" or Archaea. Unlike eukaryotes, bacteria have nucleoids instead of nuclei. They are diverse metabolically, and their cell walls are composed of peptidoglycan. Bacteria is often found in tissue of other organisms, soils, or water surfaces. Bacteria have specific structural characteristics including a cell envelope, ribosomes, nucleoid, pili, and flagella. The term "bacteria" has been associated with many negative functions in life, such as human disease. However, bacteria are vital for many processes. In fact, many more bacteria cells exist than human cells in the body, especially on the skin and digestive tract. Bacteria can also be used to produce food, such as yoghurt. Bacteria are also important in the fields of biotechnology and gene therapy due to their possession of circular DNA called plasmids, which contain the genes that encode antibiotic resistance. As such, the study of prokaryotic plasmids grants scientists a deeper understanding of the genes and proteins they encode. The cell wall, which is made of peptidoglycan, is essential for the survival of bacteria. The way an antibiotic like penicillin is able to kill bacteria is to inhibit a step in the peptidoglycan synthesis. There are two different types of cell walls - gram positive and gram negative. Most bacteria have gram negative. Molecular studies suggest the existence of 50 or so bacterial phyla (considered kingdoms by some). However, the structural and metabolic features of about half of these are unknown. Though some members of domain bacteria live in extreme environments, many more favors moderate conditions. Many bacteria form symbiotic associations with eukaryotes and are thus of concern in medicine and agriculture. The most important two phyla that are important to eukaryotic cell evolution, global ecology, and human affairs, are Proteobacteria and Cyanobacteria. The cell wall in bacteria serves as a physical barrier between the cell and its surroundings. It maintains the shape of the cell, protects from physical penetration and prevents the cell from lysing under hypotonic conditions. The rigidity of the cell well is due to Peptidoglycan, a grid of sugar polymers connected by short amino acid chains, usually 3-5 amino acids long. Peptidoglycan is unique to the cell walls of bacteria, as eukaryotic cell walls are generally made of chiten or cellulose, and archaea bacteria have cell walls composed of other polysaccharides and proteins. The cell wall of bacteria falls into two categories, Gram-positive and Gram-negative, named after the gram strain test that initially separated the two categories. Gram staining uses the structure of the cell wall to differentiate two main types of bacteria: Gram-positive and Gram-negative. It is often one of the first steps used in identifying prokaryotes. However, there are exceptions that make this method fallible, as there are some organisms that are Gram indeterminate or Gram variable. All bacteria have a cytoplasmic membrane that encloses the cell. On top of that, only Gram-positive bacteria have thick peptidoglycan cell wall. Although Gram-negative bacterial cells have very thin peptidoglycan, they have an extra layer called the outer membrane. Gram staining focuses on the differences of such structure in its method of identification. There are four main steps to this staining. The first step is to carry out the primary stain using crystal violet (deep blue) after the bacterial cell is heat fixed. This dye stains the surface of both Gram-positive and Gram-negative blue. After residual dye is rinsed off, Gram's iodine or Lugol's solution is added to help increase the crystal violet's interaction with the negatively charged surface, increasing the binding. Although Gram's iodine is of dark brown color, it does not change the color of the primary stain. Crystal violet-iodine (CV-I) complex may form in this step. Adding the decolorizer is the crucial step of this process. The decolorizer solubilizes lipids and dissolves the outer membrane structure. After the outer membrane is gone, it can easily pass through the thin, porous layer of peptidoglycan as well as the cell membrane. It flushes out the CV-I complex, resulting in the Gram-negative cell being destained and colorless. The thick peptidoglycan layer of the Gram-positive bacteria slows down the entry of decolorizer. Since the decolorizer is also a dehydrating agent, it shrinks the pores in the peptidoglycan layer so as the CV-I complex is going to be flushed out, they are trapped within the layer. The timing of decolorization is important and can be halted by rinsing with deionized water. The last step is the counterstain. This provides a contrasting color to the primary stain, and the staining depends on the amount of crystal violet already present. This will stain the Gram-negative cells readily but cause little to no effect to the blue coloration of Gram-negative cells. Gram-Positive bacteria is characterized by its much thicker layer of peptidoglycan in the cell wall, usually 20 to 80 nanometers thick and composing about 90% of the dry cell weight. In most gram-positive bacteria it is the only component of the cell wall, located just outside the plasma membrane. This makes Gram-positive bacteria susceptible to common antibiotics such as penicillin. Penicillin works by preventing the protein cross-linking of polysaccharides in Peptidoglycan, thus rendering the cell defenseless after its failure to produce Peptidoglycan. Gram-negative bacteria is characterized by its thinner layer of peptidoglycan in the cell wall, usually only 7 to 8 nanometers thick and composing about 10% of the dry cell weight. This reduction in peptidoglycan is due to the fact that Gram-negative bacteria have another protection layer in the form of lipopolysaccharides, located outside both the plasma membrane and peptidoglycan layer. The lipopolysaccharides (LPS) greatly enhance the cell rigidity as well as protect the cell from certain chemical attacks. The LPS has many useful functions to the gram negative bacteria: increases the negative charge of the cell membrane, excludes large hydrophobic compounds, and protects from phagocytosis. The LPS layer in gram-negative bacteria protects the peptidoglycan layer from being deteriorated by penicillin. Other drugs, such as ampicillin, have been created to attack the LPS layer in certain gram-negative bacteria. This is significant as without the LPS layer gram-negative bacteria dies. Gram-negative bacteria are generally much more pathogenic than Gram-positive bacteria, as LPS is an endotoxin.Treating gram negative bacteria is hard because the increasing concentration of lipid A, a part of LPS, in patient's blood would lead to peptic shock and dead. Peptidoglycan is a three dimensional mesh, made up of repeating disaccharide subunits cross-linked by stem peptides, which surrounds the entire bacterial cell wall. Peptidoglycan helps in maintaining cell shape, protecting against distress due to difference in osmotic pressure, and helping in the formation of daughter cells during cell division. Biosynthesis of peptidoglycan occurs in two different cellular compartments: the cytoplasm and the periplasm. Biosynthesis of peptidoglycan begins in the cytoplasm which contains the ATP-dependent amino acid ligases of the Mur family of enzymes. First to occur is the generation of UDP-MurNAc by MurA and Mur B with the addition of a stem peptide to the UDP-MurNAc by MurC, D, E and F creating the substrate UDP-MurNAc-pentapeptide. This substrate is then ligated to an undecaprenyl phosphate carrier lipid by the integral membrane protein Mra Y, creating the membrane bound substrate Lipid I. The last step is the addition of a GlcNAc molecule from another UDP-MurNAc to Lipid I creating Lipid II. Lipid II is then transferred to the periplasm where the next stage begins. Because all peptidoglycan biosynthesis intermediates are soluble, in order to prevent them from diffusing across the membrane, a cytoplasmic complex forms which regulate their diffusion and facilitates the transfer of Lipid II to the periplasm. This cytoplasmic complex is made up of the soluble MurA-F proteins, the integral membrane MurG and MraY proteins as well as the cytoskeletal MreB. MreB forms the helical cables along the entire cell and helps maintain the cell’s shape. MreB also affects where the MurB-G enzymes localize in the cytoplasm. Once in the periplasm, Lipid II undergoes both polymerization of glycan chains, called glycosyltransfer (GT), and cross-linking of the stem peptides, called transpeptidation (TP). Both reactions are catalyzed by penicillin-binding proteins (PBP’s), a form of peptidoglycan synthases. There are two types of PBP’s working to catalyze the GT and TP reactions. High molecular mass PBP’s have either both GT and TP domains (Class A PBP’s) where the GT and TP reactions occur or a TP domain preceded by an N-terminal pedestal (Class B). Low molecular mass PBP’s on the other hand regulate cross-linking reactions by cleaving the peptide bonds in the stem peptide of Lipid II. In the TP reactions, the C-terminus of the peptide chain is mostly in the active site cleft of the PBP while the N-terminus points out towards the solvent. The freeing of the N-terminus allows for TP reactions to occur between the amino acid of the third stem peptide residue and a neighboring peptide. In studies with E. coli bacteria, class A PBP’s have shown to interact with the outer membrane bound enzyme MltA. Both interact with one another via the scaffolding protein MipA which is also linked to the outer membrane, implying that peptidoglycan-synthesizing macromolecule complexes are able to anchor themselves to both the inner and outer membrane. Interestingly MreB has also shown to participate in the biosynthesis of peptidoglycan in the periplasm. MreB determines the helical pattern in which the peptidoglycan precursors are inserted into the cell wall as well as promoting the GT activity of PBP’s. In order for this to occur MreB forms a cytoplasmic complex with the inner membrane protein RodZ. Depending on the cyplasmic region of RodZ, it co-localizes with MreB in a helical manner. The MreB and RodZ complex acts as a ‘trans-membrane’ link between the cytoplasm, cytoskeleton and the periplasm which not only stabilizes cell wall elongation but also ensures that the peptidoglycan precursors are inserted in the cell wall in a spiral-like fashion. PBP’s are found between the membrane and the periplasm where both Class A and Class B PBP’s form a complex with the membrane-associated protein MreC via MreC’s β sheet-rich C-terminal region. It is MreC which acts as the framework for the periplasmic peptidoglycan-biosynthetic proteins and who also participates in cell wall elongation, interacting with RodZ. Along with participating the biosynthesis of peptidoglycans, PBP’s are also the targets of β-lactam antibiotics which covalently bonds to the bacterial cell wall by mimicking the structure of the stem peptide substrate. Over the years bacteria’s have become more resistant to β-lactam antibiotics. This is mostly due to mutations in the PBP’s sequence along with structural modifications of the enzymes around their catalytic cleft. These mutations and modifications decrease the binding stability of the antibiotics stopping them from binding to the bacterial cell wall and killing the bacteria. MreB is a cytoskeleton element that assembles into filamentous structures within the bacterial cytoplasm.MreB and its homologs have been shown to interact and co-localize with cytoplasmic protein( MurB-G), membrane-imbedded proteins ( MreD, MraY and RodA) as well as other molecules with large periplasmic domain in organism. Recent research shows that peptidoglycan precursors are inserted into cell wall following helical pattern which is dependent on MreB and It’s also reported that MreB also promote the GT activity of PBPs. This ability of MreB is because of RodZ, an inner membrane protein containing an 80-residue, N-terminal cytoplasmic region and a 200-amino acid periplasmic C-terminal tail. RodZ co-localizes with MreB helices in a manner that is strictly dependent on its cytoplasmic region. MreB- RodZ complexes act as a major stabilizing factor in bacterial cell wall and ensure s the insertion of new peptidoglycan in a spiral like fashion into the cell wall. Bacteria are simple organisms with no membrane-bound organs. has the same function as those eukaryotes. It translates the genetic material from RNA to produce proteins. the formation of a proteinaceous coat surrounding bacterial spore providing protection against enzymatic and chemical changes in the environment such as high temperatures, change in pH, or UV irradiation. There are four types of bacterial flagella arrangements. The first is monotrichous flagella, in which the bacterium has only one flagella. 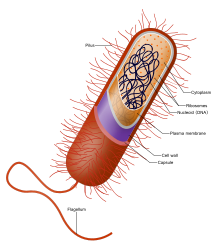 The second is amphitrichous, in which there are two flagella on opposite ends of the bacterium, but only one flagellum works at a time. The third is lophotrichous, in which there are multiple flagella located on one spot. The fourth is peritrichous, in which there are flagella pointing in all directions. The structure of the flagella is made up of four rings, the L ring, the P ring, the MS ring, and the C ring. The MS and C rings make up the basal body, which anchors the flagella to the cell. Around these two rings there are Fli and Mot proteins. The Fli proteins act as switches that rotate the flagellum clockwise or counterclockwise. The Mot proteins generate torque through a proton channel that generates electrostatic forces on the MS and C rings, causing them to spin. The hook connects the flagella filament to the motor. The filament is made of the protein flagellin. When a flagellum is made, the flagellin from inside the cell goes up through the hook and is added to the tip of the growing flagella. Though Proteobacteria share molecular and cell wall features, this phylum displays amazing diversity of form of metabolism. Genera of this phylum consists of five subgroups: alpha (α), beta (β), gamma (γ), delta (δ), and epsilon (ε). The ancestry of mitochondria can be traced to the α – Proteobacteria, which also include several genera noted for symbiotic relationships with animals and plants. For example, Rhizobium and related genera of α – Proteobacteria form nutritionally beneficial associations with the roots legume plants and are thus agriculturally important.The genus Nitrosomonas, a soil inhabitant, a soil inhabitant important in the global nitrogen cycle, represents the β-Proteobacteria. Vibrio cholerae, a γ-Proteobacteria, causes cholera epidemics when drinking water becomes contaminated with animal waste during floods and other natural disasters. The δ-Proteobacteria includes the colony-forming myxobacteria and predatory bdellovibrios, which drill their way through the cell walls of other bacteria in order to consume them. Helicobacter pylorus, which causes stomach ulcers, belongs to ε-Proteobacteria. Vibrio fischeri are bioluminescent marine gram negative proteobacterium. They can live freely by themselves or in communities that are symbiotic with Hawaiian bobtail squid. In this relationship the squid gets light to be able to camouflage from predators. The bacteria get a home and food. Together they are a model system for studying animal and microbial symbiosis. During the day the bacteria are expelled and are gathered up again during the day, because the bobtail squid is a nocturnal feeder. These symbionts are acquired horizontally, meaning they come from the environment. The squid live in shallow coastal waters, are 1.2 inches long, and have their light organ in the mantle. The mechanism by which the bacteria are able to produce bioluminescence is quorum sensing, which is a cell to cell communication process used to facilitate gene expression as a response to changes in population density. There are two paths that quorum sensing can take, low cell density and high cell density. The low cell density path is for asocial behaviors, while the high cell density path is for social and group behaviors. Cells, in this case, Vibrio fischeri are, produce molecules called autoinducers. These autoinducers will then reach a minimum threshold required for detection within the community, and they will start gene expression together, in this case: bioluminescence. The protein, luxI, makes the autoinducer, acyl homoserine lactone (AHL). The autoinducer of luxR enters the cell and binds to LuxR, which is a regulatory molecule in Vibrio fischeri. This makes a luxR-autoinducer complex, which binds to the Lux operon and promotes transcription of more luxI, which leads to more autoiducers, further expressing the lux operon. The luxA and B genes encode for luciferase which is responsible for bioluminescence. The phylum Cyanobacteria contains photosynthetic bacteria that are abundant in fresh water, oceans, and wetlands and on the surfaces of arid soils. Cyanobacteria acquired their name from the typical blue-green (cyan) coloration of their cells. This coloration is a result of the presence of accessory phycobilin pigments that help chlorophyll absorb light energy. Cyanobacteria are the only prokaryotes that generate oxygen as a product of photosynthesis. Ancient Cyanobacteria produced Earth’s first oxygen-rich atmosphere which allowed the rise of eukaryotes. The plastids of eukaryotic algae and plants arose from Cyanobacteria. Cyanobacteria display the greatest structural diversity found among bacterial phyla. Some occur as single cells, while others form colonies of cells held together by a thick gluey substance called mucilage. Many Cyanobacteria produce specialized cells and display intracellular chemical communication, the hallmarks of multicellular organisms. Many Cyanobacteria that grow in conditions of high light intensity produce protective brown sunscreen compounds at their surfaces. Cyanobacteria play an essential ecological role by producing organic carbon and fixed nitrogen. However, several kinds of Cyanobacteria, especially the genera Microcystis, Anabaena, and Cylindrospermopis, form nuisance growths in freshwater lakes during the warm season. Such growths, known as blooms, give the water a pea-soup appearance. Blooms develop when natural water receives excess fertilizer from sewage discharge or agricultural runoff. Such blooms are becoming more common every year and are of serious concern because they may produce toxins in amounts sufficient to harm the health of humans and other animals. Consequently, it is inadvisable for people or pets to swim in or consume water that has a visible Cyanobacterial boom. Mollicutes are from the phyla, Firmicutes, which are gram positive low guanine and cytosine bacteria. Most of them lack a cell wall which gives them their name since mollis means "soft" in Latin. Since they have no cell wall, they do not stain gram positive or negative, and are not affected by antibiotics such as penicillin and vancomycin that target cell walls. They are also one of the smallest groups of bacteria ranging from 0.2 – 0.3 μm long. In addition, having no cell wall makes them vulnerable, so they are often found living within another cell, which allows them to have reduced genome size. Because of this fact they often cause contamination in culturing cells in the laboratory. Mycoplasma is a genus of the Mollicutes class. Since they have no cell wall, and thus no pili, flagella, or any related movement system, it is mysterious how they move. One of the fastest members of this genus is Mycoplasma mobile, which is a pathogen to freshwater fish. They move fast relative to its size, moving at about ten body lengths per second. To put that in perspective, Usain Bolt moves at 5.3 bl/s. Under a microscope it almost looks as if they are vibrating and it causes to the propel in a random direction. It is known that their shape is closely related to how it moves. It is shaped like a light bulb, with a polar head on the narrower part. It glides unidirectionally with its head, which allows it to attach to surfaces. Scientists compared wild types and mutants that couldn't glide to figure out what proteins are needed for gliding. Antibodies were used to inhibit gliding and localize the specific proteins. Along with electron microscopy, scientists were able to make a model of the gliding proteins that looked like a leg extending out from the cell body. This structure is made out of four proteins. The "foot" is able to interact with surfaces, allowing it to look like it is gliding. The fourth protein, p42, in this "leg" uses ATP hydrolysis to move the structure. The whole structure almost looks like a centipede in motion. This process makes it look like M. mobile can "walk" across surfaces. These bacteria are extremophiles that consist of the phyla: Aquificae, Thermotogae, Thermus-Deinococcus, and Chloroflexi. These phyla are the most deeply branched. They are similar to Archaea, in that they share some of the same environments, and have similar physiology. They also have the fastest doubling rates of all cells, making them have higher rates of mutation. These bacteria can be found in hot springs, sulfur pools and deep sea vents. They can survive in temperatures from 85-95°C. They are chemolithoautotrophs, making their own energy from inorganic compounds in the environment, that are the primary carbon fixers in their respective environments. These bacteria produce waster as a byproduct, hence their name. This phylum of bacteria is are cocci, and are special for their high resistance to environmental extremes such as high temperature and even radiation. These bacteria have a think cell wall, which makes them resemble gram positive bacteria, because they retain the violet stain. However, they have an outer membrane on their cell wall, so they are more closely related to gram-negative bacteria. One of the reasons that these bacteria are so resistant to their environment is that an amino acid in their peptidoglycan wall is substituted with a special amino acid. Instead of having a peptide cross link, between diaminopimelic acid (DAP) and D-alanine, DAP is replaced by L-ornithine. One notable member of this phyla is Thermus aquaticus. This species is important in PCR, because their DNA polymerase, Taq DNA polymerase, is resistant to heat that is used in PCR. These bacteria are also thermophiles and hyperthermophiles. They can be found in hot springs and hydrothermal vents. They stain as gram negative, but lack a second cell membrance, and are anaerobic, do not need oxygen. Their phylum name is derived from the fact that they live in hot environments and have a "toga" sheath surrounding the cell. This phyla has possible uses in biotechnology, because of its ability to function at high temperatures. They are currently being used in research for alternatives to fossil fuels, because they can make hydrogen gas from carbohydrates. Bacteria in this phyla have a variety of extremophile traits. Some are moderate thermophiles, aerobic, anaerobic, and photoheterotrophs. These bacteria mostly stain gram negative, but have one cell membrane. The Chloroflexus species contain photosynthetic apparatus within chlorosomes. The type IV secretion system spans through the bacterial cell envelope with ATPases, VirB4, VirB11, and VirD4 powering substrate secretion and assisting in the assembly. According to biochemical data, the inner membrane channel consist of inner membrane protein VirB6 and VirB8. The protein VirB10 is a major component of the outer membrane of the type IV secretion system. In different types IV secretion systems, an extracellular pilus comprised of VirB2 and VirB5 may be present. It was recently discovered that a core complex is created from VirB7, VirB9, and VirB10 forming in the inner membrane and inserting itself into the outer membrane. The core complex that forms in the inner membrane is usually comprised of VirB7, VirB8, VirB9, and VirB10 which are referred to as core proteins in a type IV secretion system. Tests have been studied on the core complex showing that VirB7, VirB9, and VirB10 form a 1.05-MDa complex that is inserted in both the outer and inner membranes. The structure of the outside membrane with the O-layer contains 14 copies of the CTD of VirB10, VirB9, and full-length VirB7. VirB10 proteins have the ability to inserts itself into the inner and outer membranes. When the core complex is viewed at different sites, the VirB10CTD forms an inner ring that surrounds the VirB9-VirB7 complex and it also forms the inner wall of the complex. The outer-membrane complex contains three proteins that are essential for complex assembly and channel formation. The protein VirB10CTD directly interacts with VirB9CTD while VirB7 interacts with VirB9CTD only. The inner-membrane of the core complex consists of an I-layer that is made of the protein VirB9 and VirB10. The inner-membrane protein VirB8 composed of an N-terminal transmembrane segment is inserted into the inner-membrane along with the protein VirB6. Various type IV secretion systems contain ATPases that supply energy for substrate translation and apparatus assembly. In Gram-negative or Gram-positive bacteria, coupling proteins are found in the type IV secretion system. The coupling proteins in the type IV system are used in substrate recruitment during secretion. VirB11 are peripheral inner-membranes proteins that can be found in a type IV secretion system. Type IV secretion systems also contain tubular pilus structures. Virulence factors are properties that allow for a microorganism (in this case bacteria) to establish itself within the host cell and enhance its ability to cause disease. The first step in bacterial infection is colonization of bacteria in host cell aided by adherence factors. In general, adherence to a host cell depends on a eukaryotic acceptor and a bacterial ligand. The eukaryotic acceptor is usually a carbohydrate or peptide residue on the membrane surface while the bacterial ligand, or adhesin, is a macromolecular component of the cell surface that interacts with the receptor. A common adhesin is the fimbrae, which are proteins filaments on the bacterial surface. A bacterial cell will first approach the host cell in nonspecific adherence, which includes possible hydrophobic interactions and electrostatic attractions. This is the docking phase of the bacterial cell leading to specific adherence, which involves permanent formation of bonds between the bacteria and host cells that are mostly irreversible under physiological conditions. After colonizing a host cell, bacteria will utilize invasion factors to break down the host’s defenses. These substances are termed invasins and act in short distances to break down primary and secondary cell defenses. Many bacteria are also surrounded by capsules that protect them from phagocytosis or opsonization. Spreading factors affect the physical properties of tissues and intercellular components of cells helping to spread the bacteria. Hyaluronidase is in enzyme that attacks the connective tissue by depolymerizing hyaluronic acid. Collagenase breaks down collagen, which is a major building material for muscles and tissue. Neuraminidase breaks down sialic acid, which gives structure to the epithelial cells in the intestines. In a multicellular organisms, it is not only essential to control the rate of cell division but also to control the rate of cell death of cells that are no longer needed. Programmed Cell death (PCD) is a bacterial stress response which leads to cell suicide mediated by an intracellular program and is responsible for eliminating unwanted or potentially harmful cells. mazEF is one of the toxin-antitoxin systems that have been found on the chromosomes of many bacteria including Escherichial coli that was discovered to play an important part in bacterial programmed cell death to regulate the amount of cells and to assist bacteria on coping with a stressful environment change. The mazEF module consists of two adjacent genes, mazF and mazE. MazF is a stable, long-lived toxin while MazE is a labile antitoxin that is antagonizes MazF and are degraded in vivo by ClpPA serine protease. These two genes are co-expressed and the mazEF system is negatively autoregulated by the combined action of those two proteins on the mazEF promoter P2. Under stressful condition change such as perpetual alterations in temperature, osmolarity, pH, and nutrition levels, mazEF coexpression is inhibited because of the degradation by of MazE. As a labile protein, MazE is easier to be degraded than MazF. This trend leads to the difference between the two proteins in cellular concentration in which MazF is dominated and thus, triggers program cell death. Modes of MazF action Because MazE has failed to inhibit MazF, its toxic effect continuously exerts. Under stressful conditions, the activity of MazF will bring up 2 issues that coordinately produces a distinct pool of stress proteins to response to the condition: 1/ the formation of leaderless mRNA (by removing the 5’-unstranslated region of specific mRNAs) and inhibition of protein synthesis: mazF inhibits the synthesis of about 90% and but selectively enables the specific synthesis of about 10% of proteins for the survival of a small subpopulation of proteins under stressful condition. 2/ formation of the stress translation machinery: MazF removes 43 nucleotides from the 3’ terminus of the 16S rRNA to from stress-ribosomes which are responsible for translating leaderless mRNAs. The pathway using the specialized translation machinery provides a fast and efficient response to a variety of stressful conditions that cells have to cope with. ↑ Campell, Neil; Jane B. Reece (2004-12-23,). Biology. San Francisco, California: Benjamin Cummings. pp. 534–536. ISBN 978-0-8053-7171-0. ↑ a b Salton MRJ, Kim KS (1996). Structure. In: Baron's Medical Microbiology (Barron S et al., eds.) (4th ed.). Univ of Texas Medical Branch. ISBN 0-9631172-1-1. http://www.ncbi.nlm.nih.gov/books/bv.fcgi?rid=mmed.section.289#297. ↑ Slonczewski, Joan, Watkins, John, Foster. (2009). Microbiology: An Evolving Science. pp. 721. ↑ Slonczewski, Joan, Watkins, John, Foster. (2009). Microbiology: An Evolving Science. pp. 718. ↑ Stewart I, Schluter PJ, Shaw GR (2006). "Cyanobacterial lipopolysaccharides and human health - a review". Environ Health 5: 7. doi:10.1186/1476-069X-5-7. PMID 16563160. Mattei, Pierre-Jean, David Neves, Andrea Dessen. "Bridging cell wall biosynthesis and bacterial morphogenesis." Structural Biology (online). Nov. 2010. Slonczewski, Joan, and John Watkins. Foster. Microbiology: An Evolving Science. New York: W.W. Norton, 2011. 717-18. Print. Moll, Isabella, and Hannah Engelberg-Kulka. "Trends in Biochemical Sciences." Trends in Biochemical Sciences. 37.11 (2012): 493-498. Web. 28 Oct. 2012. <http://ac.els-cdn.com/S0968000412001119/1-s2.0-S0968000412001119-main.pdf?_tid=c0222dc8-215e-11e2-a403-00000aacb361&acdnat=1351470340_177eb1398fa277f3bb5dea0eea48db79>. This page was last edited on 6 August 2017, at 13:25.